This book, first edited with an introduction by F. A. v. Hayek in 1939, explores some of the popular errors which related to the suspension of the cash payments of the Bank of England, and to the influence of our paper currency on the price of provisions. The introduction provides an interesting overview of the life, thoughts, and achievements of Henry Thornton. 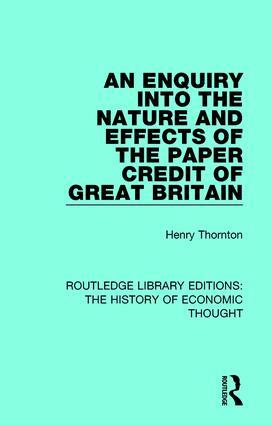 An Enquiry into the Nature and Effects of the Paper Credit of Great Britain will be of interest to students of the history of economic thought.